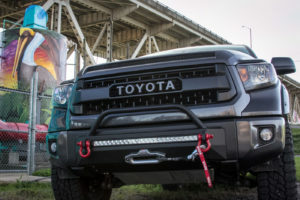 Designed and developed to suit the 2014-Current Toyota Tundra, the ARB Summit Bumper is now available for the SR, SR5, Limited, Platinum and 1794 edition models. The ARB Summit Bumper showcases the latest styling from ARB. Features include press form cover straps, larger ARB fog lights, surround, and a three-piece split pan grille with access doors for winch clutch operation. It also includes a recessed winch control box mount for a sleek, integrated appearance. The Tundra Summit Bumper is finished in ARB’s textured black Integrit™, offering class-leading protection and unparalleled corrosion resistance with an ultra-low sheen matte finish.